The song Old Cape Cod had me looking forward to an enchanting, tiny sand dune tucked into the lapping sea. Once I got across Massachusetts I started up Cape Cod. For sixty miles I didn’t even see the sea! Apparently there were quaint little villages here and there, but they were on the Atlantic Ocean and Cape Cod Bay, not along US Highway 6. Today a freeway for half the distance of the cape, in 1969 Hwy 6 was a two-lane affair running smack up the middle of the massive sandbar. The only tiny things I noticed while hitch hiking Cap Cod were the short little rides I got from summer home owners heading back from whatever chores were keeping them in a scurry. Yet I was rewarded—at the end of those sixty miles was Provincetown, the enchanted town Patti Page had promised. Provincetown, right at the very tippy tip of Cape Cod, was, indeed, a quaint little village. Yes, it was filled with good looking tourists in bright colors carrying every sort of beach paraphernalia one can imagine. It was busy. And it was quaint. As busy as the town and the grocery and the shell shops were, they were roomy compared to the gay bar. Which was perfect for me! What can I say? I was young and tall and carrying a pack. Finding a place to crash was no problem at all. And, folks, after months of the agrarian beauty of living in an isolated Catskill Mountain retreat, I was ready to pursue some lust! Before long I was invited to a most fun and accommodating crash pad. For three days I was out every day enjoying the sun and sea and dunes and salty air. 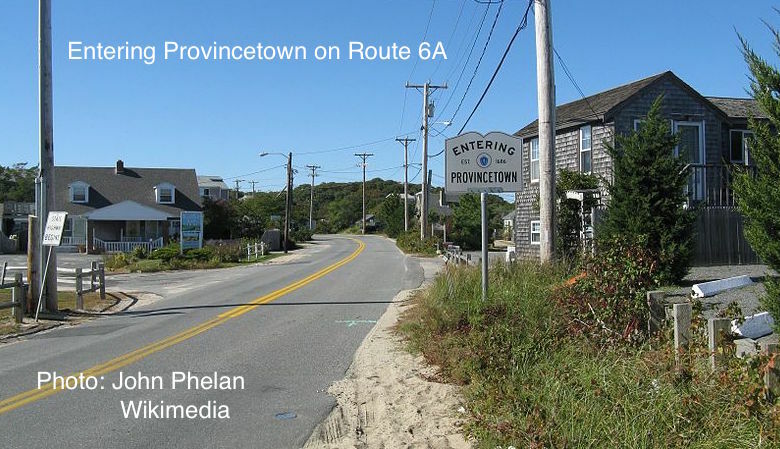 This entry was posted in Hitchhiking and tagged Cape Cod, gay bars, Patti Page, Provincetown, tourists on August 14, 2015 by deansgreatwahoo. I was in Provincetown once in October. It was so quiet I wondered if some caticlysmic event had occured while we drove down the quiet little road with the radio turned off.